In a twentieth-century version of the Socratic paradox, Albert Einstein once declared that ‘as our circle of knowledge expands, so does the circumference of darkness surrounding it’. Wisdom is to know the right questions to ask about that darkness, whether in the vast expanses of theoretical physics or in the more confined reaches of the medieval past; for this, a scientist or scholar has to be formidably well-informed. Illumination can theoretically come in a flash, but in the humanities at least is far more likely to be the outcome of a long drawn-out process of research and reflection. 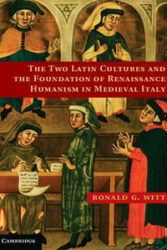 In this respect, Ronald Witt’s The Two Latin Cultures and the Foundation of Renaissance Humanism in Medieval Italy is exemplary: following In the Footsteps of the Ancients: the Origins of Humanism from Lovato to Bruni (Leiden & New York, 2000), this second volume, chronologically preceding the first, is the product of more than four decades of acute enquiry, pushing the frontiers of our knowledge and the circumference of darkness back from Lovato’s Padua in the thirteenth-century by a further five centuries. The question that Witt sets out to answer, raising many others as he goes, is why the culture of Italy, or more specifically of the regnum of the northern half of the peninsula, was fundamentally different from that of the rest of western Europe in the Middle Ages. The answer – the emergence of a lay intelligentsia dominated by lawyers – is articulated with minute detail and great clarity over twelve chapters stretching from the Lombard intellectuals at the court of Charlemagne in the 770s to the classicizing scholars in Padua who laid the ground for Petrarch and early Renaissance humanism. The two Latin cultures of the title are that of the book, traditionally fostered by the clerical elite of the Church, and the emergent culture of the legal document produced by notaries for administrative, practical or political purposes. The notariate, already in evidence by the mid 8th century, was institutionalized as a lay body from which clerics were largely excluded by c. 900; lawyers were to become (and arguably, as Berlusconi has discovered to his cost a millennium later, remain) the principal source of law and order in the regnum. It was this development that marked the key difference between the north of Italy and the rest of Europe. Broadly speaking, the culture of the book declined in Italy, as did the cathedral schools, from the time of the controversy between Pope and Emperor over the investiture of bishops (1057-1122); it was from then onwards by contrast that in the cathedral schools of Northern France the book became the basis of what is known as the twelfth-century Renaissance. Perhaps the most significant impact of the investiture struggle was the emergence of the communes in the regnum: the urban population, led by secular officials, became highly politicized with city government increasingly in the hands of laymen and especially lawyers. One major implication of these early developments for intellectual life is the birth of the universities independent of the cathedral schools. It was in Bologna that private law schools first emerged, where laymen taught not only Roman and canon law (which bred a new legal book culture embodied by the compilations of Justinian and Gratian), but also grammar and rhetoric, and, from the early twelfth century, the ars dictaminis, the new art of letter-writing. By the following century, however, rhetoric and grammar and their teaching had become more firmly anchored in civic life in Padua, which explains the preponderant role of Paduan intellectuals in the revival of interest in and imitation of Latin classical authors that became the hallmark of humanism. Other features that appear to distinguish the regnum are the apparent paucity of Latin literary prose and poetry over some five centuries, and the relatively late emergence of vernacular literature. For the first of these the explanations must almost of necessity be arguments a silentio about the absence of manuscripts containing such works, but here and elsewhere Witt uses them to challenge received opinion or to point in new directions. As regards the vernacular his conclusions are more traditional, bearing principally on the inherent tension between the courtly ethos that inspired vernacular poets elsewhere in Europe and the more republican values of the city states. This magnificent study, to which no brief summary can do justice, offers a narrative of uncommon density, built upon and expanding a massive body of scholarship. It is for instance peopled by an extensive cast of minor or almost unknown figures who often for the first time find their place in an overarching account of cultural and intellectual progress. It is almost axiomatic that the majority of these men are lawyers. Witt is a master of synthesis with a rare capacity for piecing together the scattered tesserae of research – his own and that of others – into a convincing mosaic picture, even if inevitably in this act of reconstruction there are doubts (signalled from time to time by the rising frequency of occurrences of the adverb ‘likely’), disagreements and unresolved areas. But he is perfectly explicit in the open-ended nature of his enquiry, which he offers as a challenge to others: to address the questions that he raises and in doing so to push further back the cloud of unknowing that surrounds his topic and that he has done so much to disperse. This is a book that no one with an interest in the intellectual history of medieval Italy can possibly afford to ignore; it is a book furthermore that is a landmark in the discussion of the origins of the Renaissance, and will surely remain an essential point of reference, not only for the remarkable synthesis that it offers, but for the way in which it puts its material at the reader’s disposal in a bibliography and outstanding analytical index that between them account for one fifth of the volume. Such technical generosity allied to the scholarly generosity of spirit that infuses every phase of the argument is rare indeed, and can only be the mark of wisdom as Socrates described it.